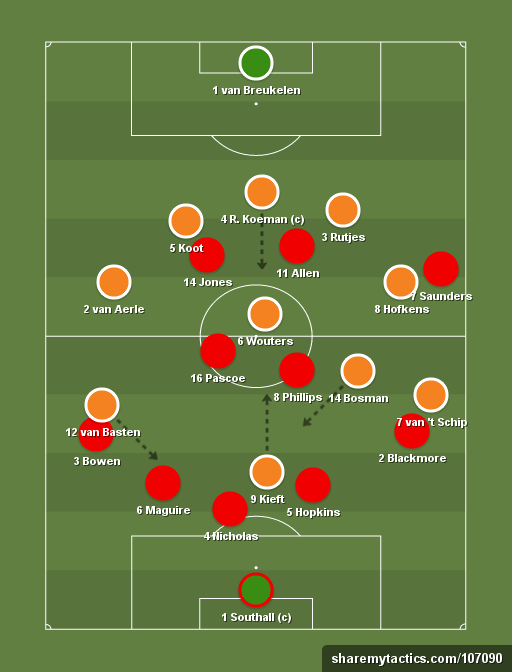 The aim of this website is to collect all knowledge and analyse every aspect of Italia'90. The site is a work in progress, with also published material being continuously revised. We will only begin publishing match reports from the 1990 World Cup tournament when all qualifiers have been covered. We are currently (April 2019) commencing work on UEFA qualifiers Group 5. Next up: Yugoslavia v France. To receive updates on twitter, follow @1990qual (kaltz) and @1990worldcup (domizio). 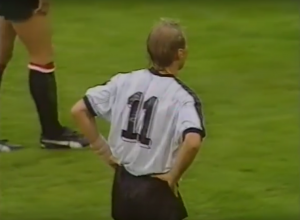 23 August 1989, Salzburg: Hickersberger was facing two challenges: How to replace Herbert Prohaska and Toni Polster? Prohaska had retired from football at the end of the 89-90 season, and the qualifier against Iceland away was likely the last official game of football in his career altogether. Toni Polster, arguably the star player of the team, was recovering from an injury and was only fit enough to start on the bench for this game. 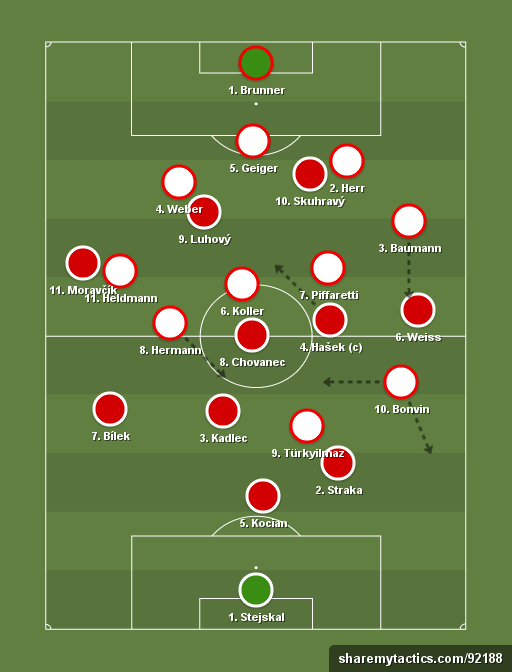 For this match, Hickersberger opted for a 4-3-3 formation, scrapping the 5-3-2 he had been using in the qualifiers thus far. Perhaps a sign of more attacking intent for this home encounter and a will to try something new. 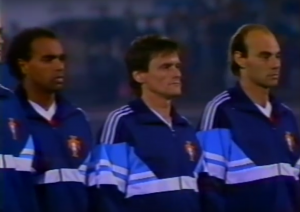 22 October 1988, Nicosia: The opening sequences of play are unremarkable, and the game sets off in what was pretty much an expected pattern: with France in possession. The Cypriots retreat quite deep back into their own half, where they sit and wait for the visitors' attacking play. France had been showing glimpses of imagination in the home fixture against Norway, even if they had at times been struggling with their creativity. 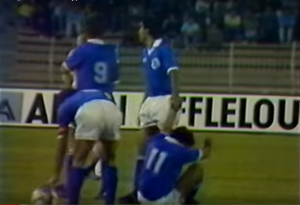 In particular their supposedly strongest creative outlet, Toulouse's 24 year old midfield man Gérald Passi, here seen making his eleventh international appearance, had too often failed to live up to demands, and he had been substituted at a point during the second half. Read more . . .
One of the last qualifiers covered at italia1990.com is Iceland v Soviet Union (31 August 1988) from UEFA Group 3, provided by our writer kaltz. 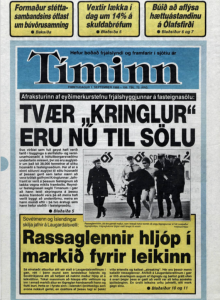 In addition, we give you the front page of the Icelandic newspaper Tíminn on 1 September 1988: Its headline was not so much the result of the game, as the naked person who entered the field. This is allegedly the first time this phenomenon was witnessed on a sporting venue on the island. Insular innocence stolen. Who was Belgium's regular libero in the 1990 qualifiers? And who's the player in the middle in the picture to the right? Test your UEFA qualification group 7 knowledge with our new group 7 quiz. Difficulty level: Difficult . . .
Italia1990.com is a website dedicated to the 1990 FIFA World Cup. With the aim to collect all knowledge and analyse every aspect of Italia'90, this website will for a considerable time be a work in progress. The website publishes everything worth to know not only about the World Cup tournament itself, but also its build-up, including the qualification stage. While match info and statistics are important, this website will also stress match reports, anecdotes and analyses. Two writers are currently engaged in the project, kaltz (@1990qual) and domizio (@1990worldcup). This website, italia1990.com, is non-commercial and unofficial, and not affiliated to FIFA. Header image: The sky above Stadio Olimpico, and the area around the stadium (1989). This website is open to improvements and corrections. We seek all knowledge available on the 1990 World Cup (incl. the qualification) and are interested in all possible stories and perspectives. Please get in touch if there is anything you would like to notify us about.